On Sunday May 1, nearly 300 people gathered at the San Bernardino Immigration and Customs Enforcement Detention Facility on W. Rialto Ave. in San Bernardino and made the nearly 5-mile trek to San Bernardino City Hall. Some participants held signs that said “Luchando Por Justicia” or “Fighting for Justice” while others held signs that said “Vota!” or “Go DAPA Go.” DAPA refers to another deferred action program under review by the Supreme Court that would grant undocumented parents of U.S.-born children and legal permanent residents protection from deportation if implemented. The march was sponsored by the Inland Coalition for Immigrant Justice, local families and community members. 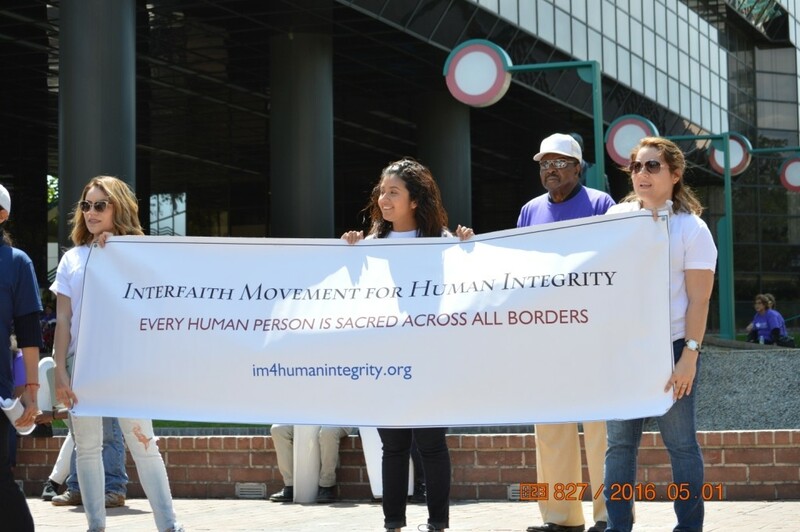 Interfaith Movement for Human Integrity is an active member of the Coalition and very active in the planning of the event.